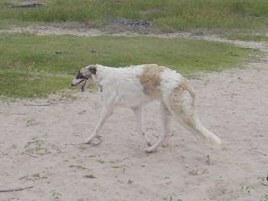 Guillermo was born at Shefaro, July 27, 2000, sired by Ch. 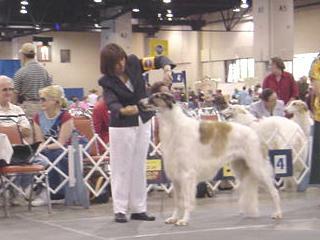 Lhaghana Dario of-Zarina out of Junior World Ch. 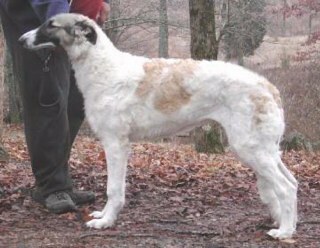 Shefaro Oksana's Elia. 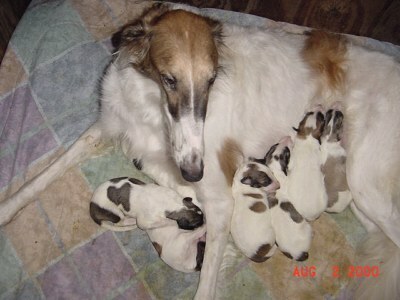 He is pictured below with Mama Elia and littermates on August 2, 2000.
and with mom on August 17. 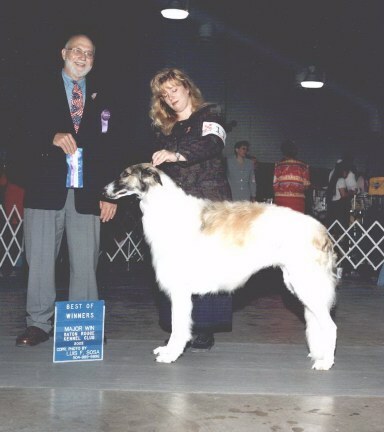 Guillermo is pictured below after winning Best Puppy competition at the Maury County KC show, Saturday, March 24, 2001, Laurenceville, TN, handled by Liz Miller. 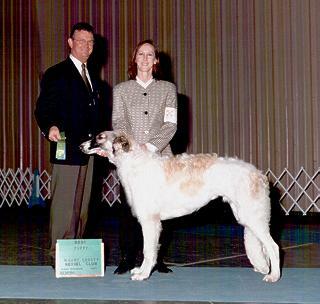 He went on to win a puppy hound group three. 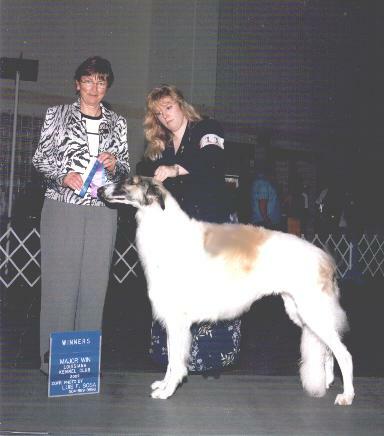 He also won his first Reserve Winners Dog (over several older competitors) in Georgia under Mrs. Anna Wanner. This is probably the last time he was touched by his former owner. When he came back to Shefaro, he didn't even know his name. His story is a fairy tale come true. Despite the adversities of his youth, Guillermo tore through the rings to his American Championship. May found him out with friends Jan and Dee Saab. 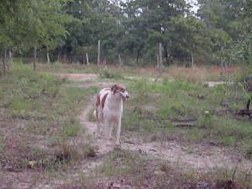 Dee showed him to WD and BOS for his first point (Tupelo, MS). Guillermo went on to win two more points (THREE POINTS) at Biloxi, MS, shown by Amanda Gibney. 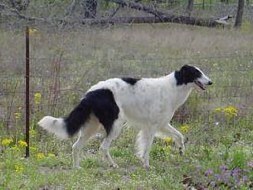 It's hard to believe that a month ago, he was FAT - 20 pounds over weight - with a fried coat and crawling with ticks at the hands of his former owner. 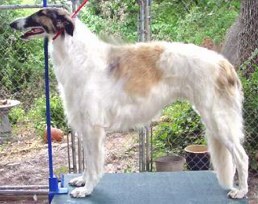 Amazing what good care, proper nutrition and exercise can do for a basically good and well bred Borzoi. 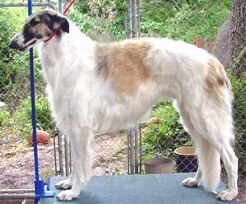 He overcame his last two years in hell and has gone on to become a big winner in the rings and a wonderful companion and friend. Guillermo is pictured with Amanda after winning the majors all three days, adding nine points to his total. (TWELVE POINTS). 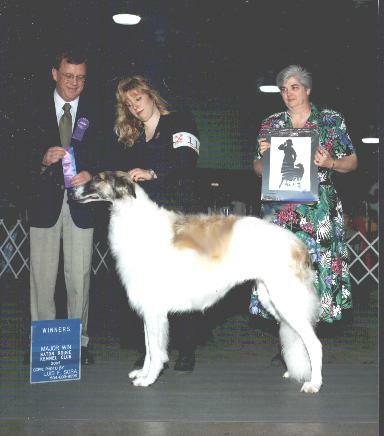 As it turns out, he showed as a youngster against a dog that was disqualified and so added another point to his total (THIRTEEN POINTS). He lacks two minor points to finish in just three show weekends with Amanda and he's not even two years old. The potential is here for a brace. 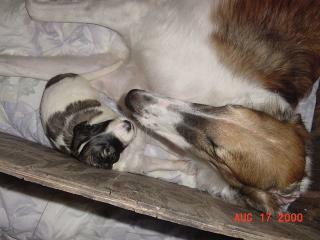 Pictured are Shefaro Elia's Guillermo and Shefaro Amadeo's Rodrigo (Elia's son). Guillermo is two years of age, while Rodrigo is six months. At this time they could be father and son. In time, they "should" look like the brothers that they are. It's a matter of time before puppy boy Rodrigo grows up and out! 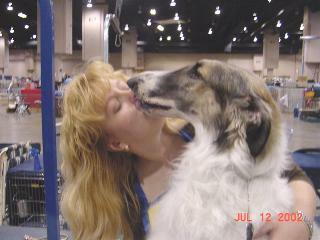 International Kennel Club, June 29-30, 2002, Hutto, Texas. Guillermo won the three V-1's required to complete his International title. 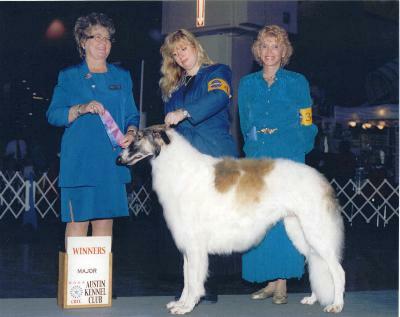 Bexar County Kennel Club, July 10, 2002, Guillermo finished his American Championship with his fourth major under Judge Joan Frailey. Here he is with friend Amanda waiting to show and finish! Guillermo leaves for his new home in Monterrey, Mexico, on July 17, 2002, with coowner Dr. Estela Leal. 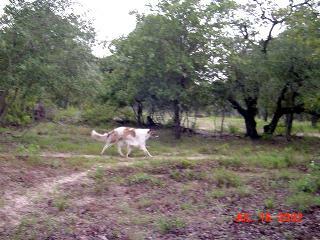 He is coowned by Dr. Leal, Dr. Helio Martinez (sister Jada's owner) and Shefaro. He will be specialed when he completes his Mexican Championship and many show pictures will grace these pages. Guillermo is pictured with Estela at San Antonio. From Refugee to Champion. 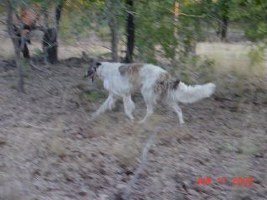 Pictured on the left is the dog that was saved from his former owner's lack of care. 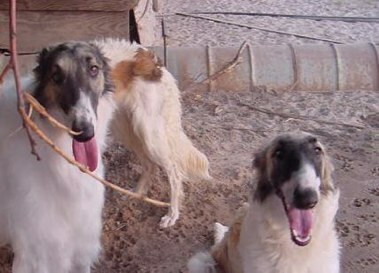 Dog on the right is American Champion Shefaro Elia's Guillermo after he was taken away from his former owner and cared for the way a Borzoi should be cared for. Hard to believe it's the same dog. It took a team effort to get Guillermo where he is today. He was removed from his former home and taken care of when Amanda Gibney took over. He came home to Shefaro and then went back out with Amanda. He's now living and showing in Mexico with Drs. Helio Martinez and Estela Leal. 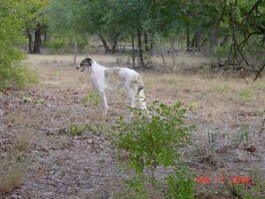 Unfortunately, while in the care of Dr. Martinez, he was bitten by a rattle snake and killed.